Wild garlic recipes are without end. Its fresh leaves can be used to prepare delicious salads or simply used as topping with bread. It also goes well with meat, as a side dish or as seasoning. 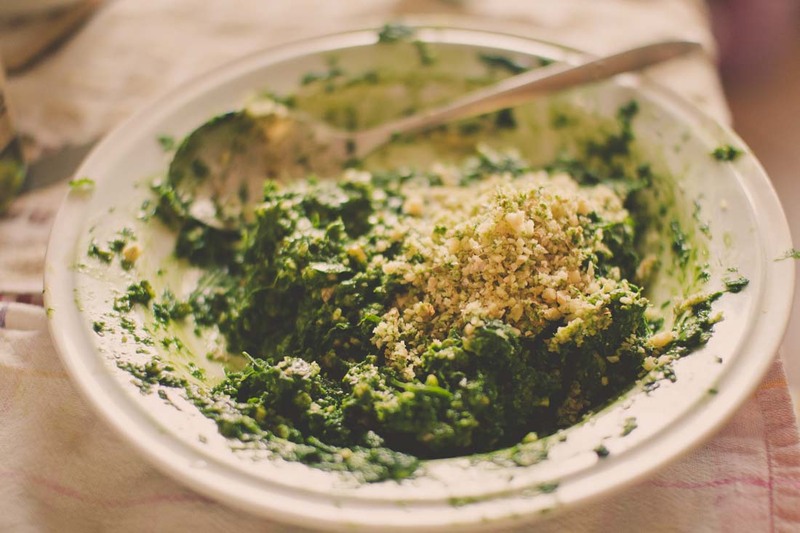 Delicious pesto is another great option, which you can use to top your pasta. The list definitely includes healthy spring soup. Find inspiration in our delicious recipes! Spring miracle – that is one possible name for wild garlic, with its exquisite spicy taste and positive effects on health. Storing this herb is no easy task, let alone preserving the important nutrients that it contains. 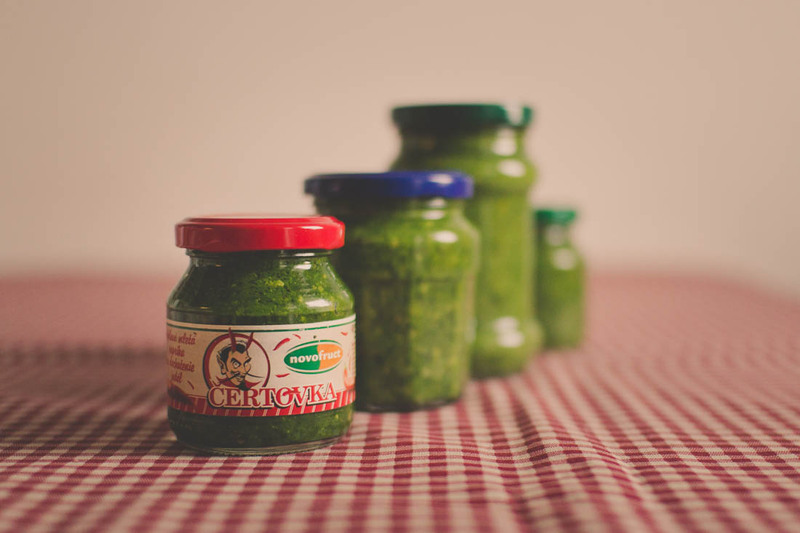 Making pesto is one of the best methods to gain as much as possible from this marvellous herb. 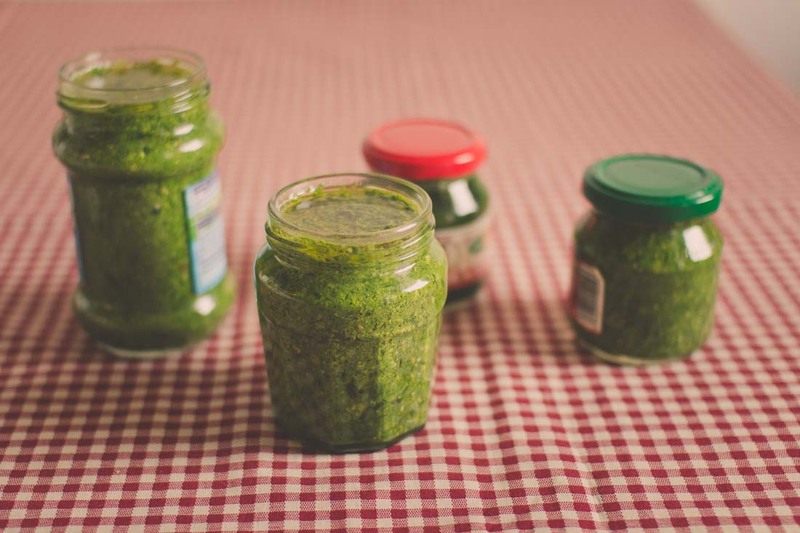 Take a look at our photo recipe for wild garlic pesto. 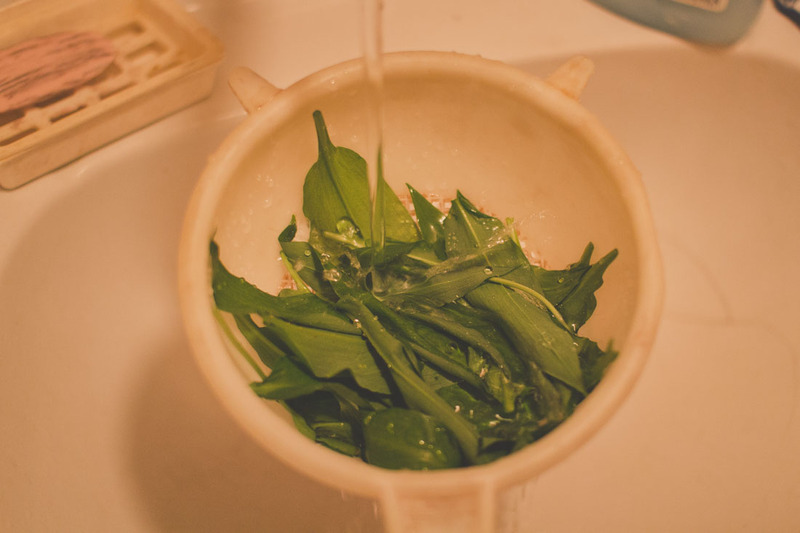 Rinse wild garlic in a strainer under a stream of cold water, thoroughly. 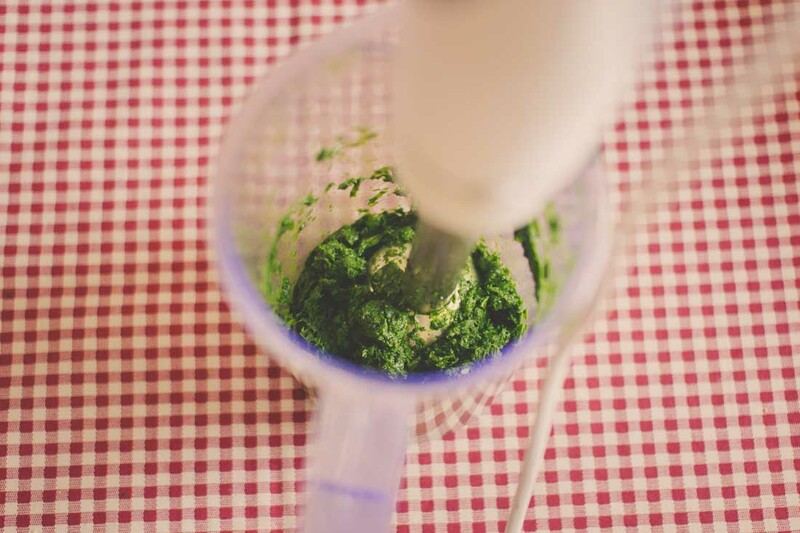 No heat or alcohol is applied to the herb when making pesto, so make sure to wash it properly. Shake water off of washed garlic and let dry for a while. 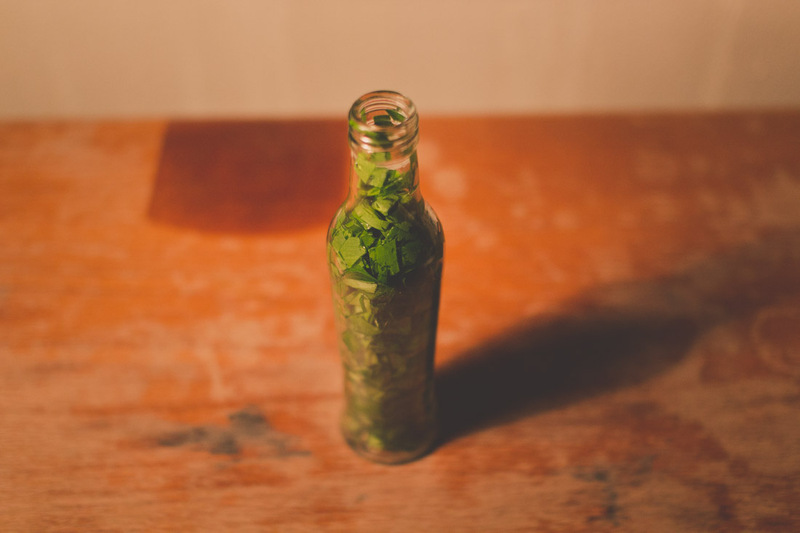 Put wild garlic in a tall container where you will blend it with a hand blender. 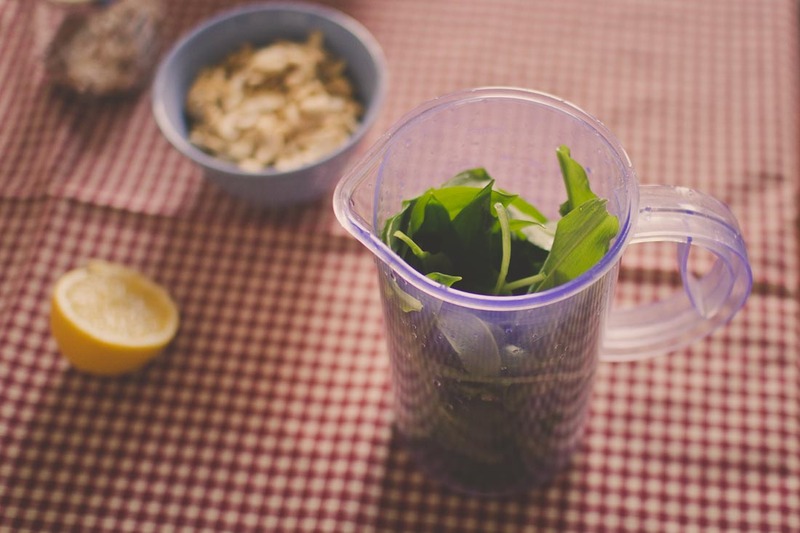 If you have a regular blender, fill it with wild garlic leaves. Start blending the wild garlic. You can already add salt, lemon and olive oil. You can mix all of the ingredients, including ground nuts, together in a deep plate or bowl. Add as much oil as necessary so that the pesto does not come out too thick. 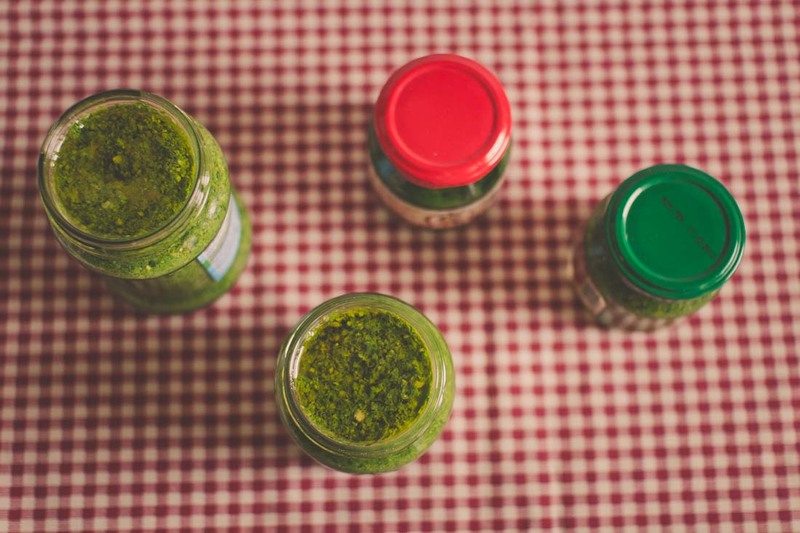 Store pesto in fridge and put it on e.g. pasta or salmon. Wild garlic is an amazing herb that has many beneficial effects for our health. Would you like to know how to preserve its strength for as long as possible? Soak it in alcohol and make tincture (extract) out of it. Take a look at our photo recipe. Wash garlic leaves thoroughly under a stream of cold water. Use strainer for ease, shake off excess water and let dry for a while. 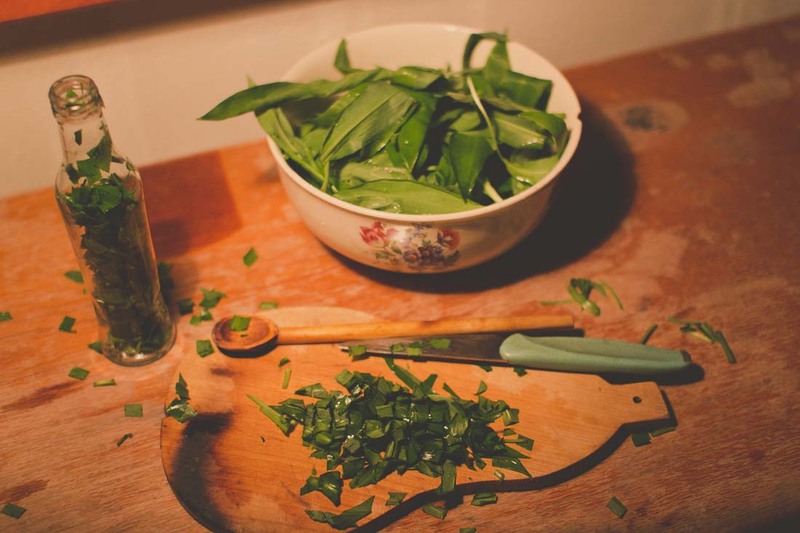 Make space on your table for cutting wild garlic and prepare all necessary implements. 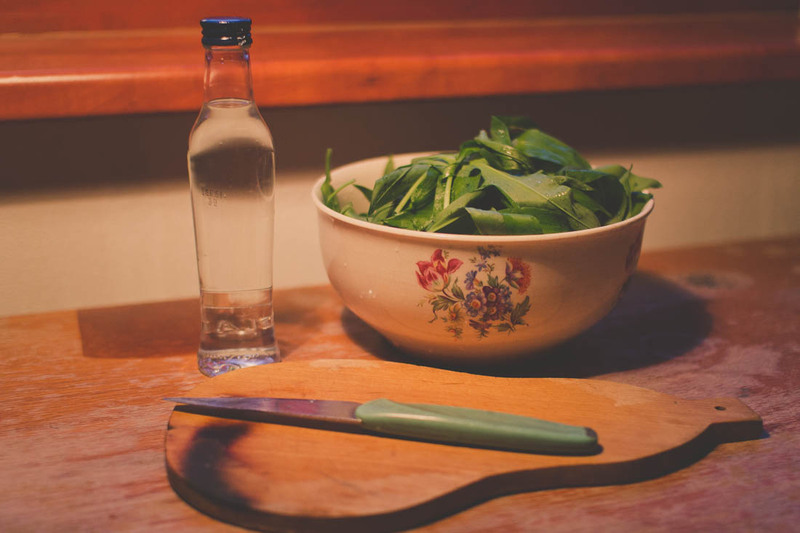 Chop wild garlic as finely as possible and gradually fill your prepared bottle. 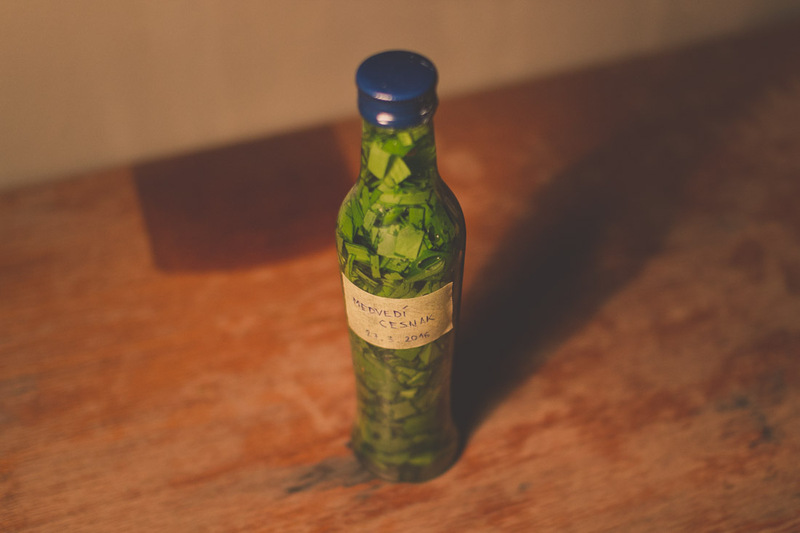 Once in a while, press the wild garlic into the bottle with the rear end of a wooden spoon. 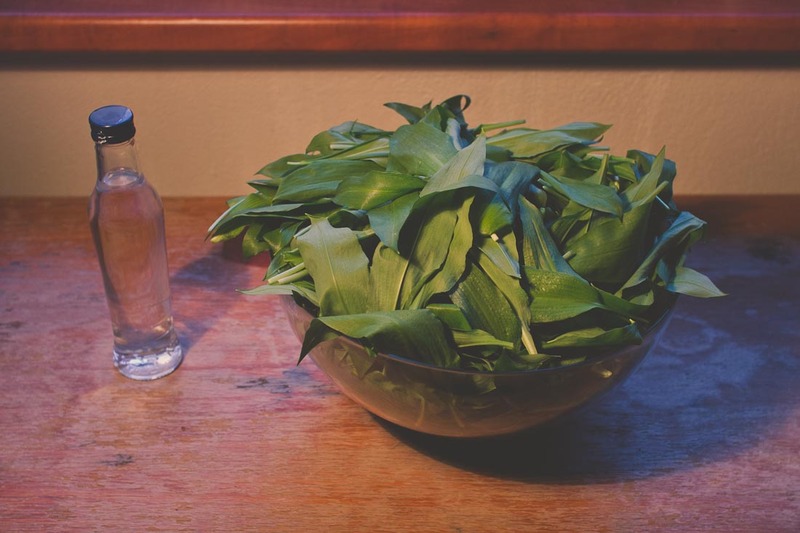 The wild garlic is ready to be soaked in alcohol – in our case, vodka. Slowly fill the bottle to its brim with alcohol. Wait for a while and refill alcohol to brim. Seal the bottle and shake it thoroughly, so that all of the air collects at the top of the bottle. If you also prepare tincture from other healing plants, we recommend that you label your bottle with a description and date. 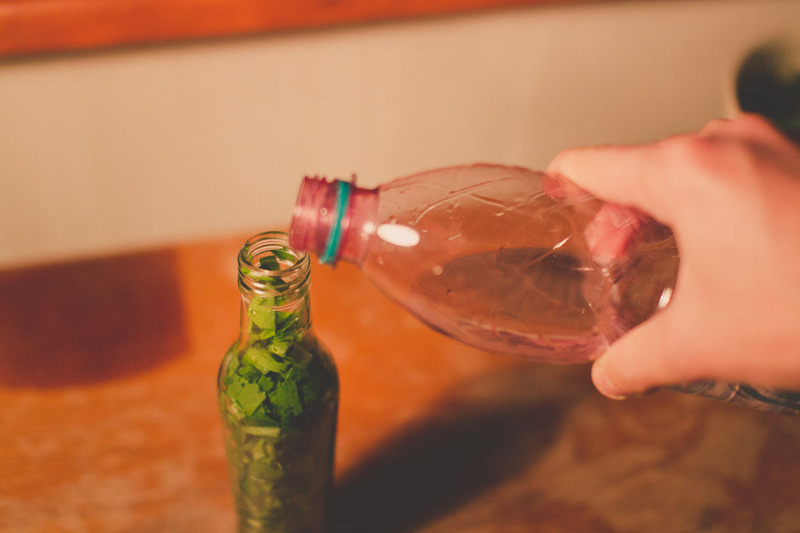 Place the bottle next to a source of heat (stove, heating …) or in the sun and wait for 14 days. Heat will allow the herb to soak well and release beneficial substances. Then simply pour the extract into a smaller container and drink 10 – 15 drops diluted with water every day. 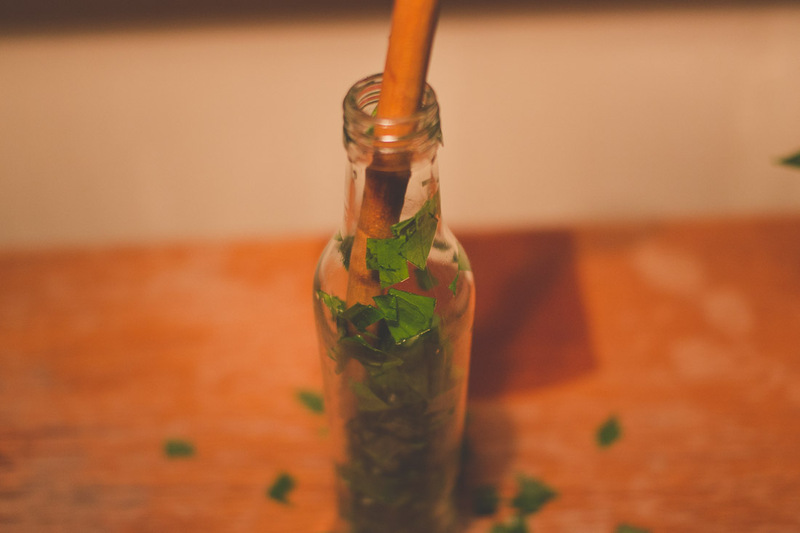 The tincture should last for 1 to 3 years, but we recommend that you prepare a new bottle every year. We wish you lots of health! Wild garlic soup is a pleasant addition to your spring diet. 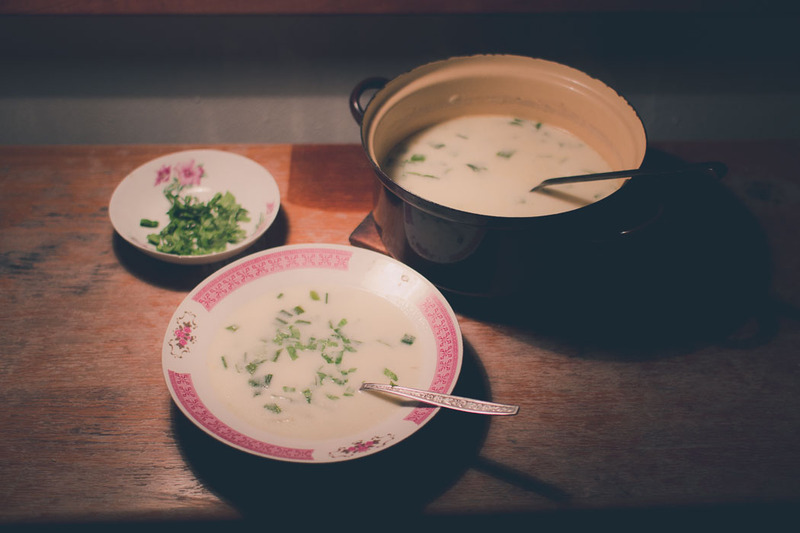 There are many recipes for wild garlic soup, but ours is very simple and delicious. 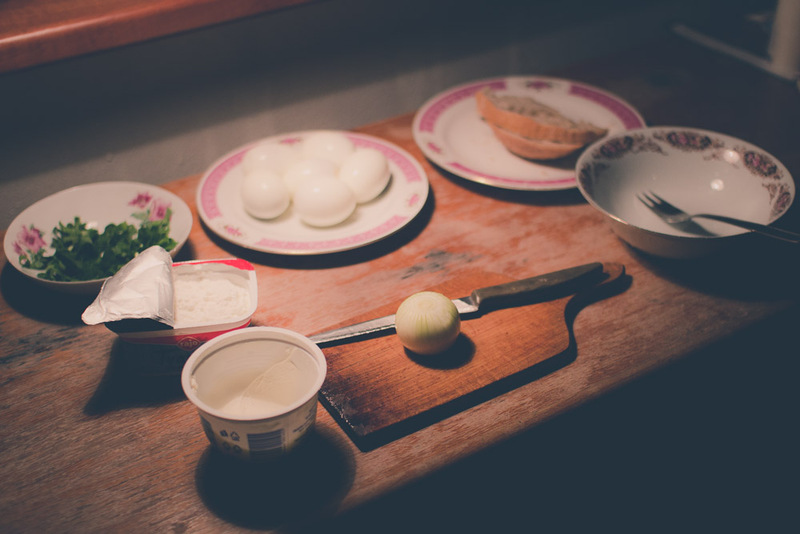 Prepare all of the necessary ingredients for cooking soup and chop spring onions, wild garlic and potatoes. Sauté onions in a large pot. After a while, add a little soft flour to form roux. Pour water over roux, add a pinch of salt and simmer for a while. Add chopped potatoes and cook them until soft. Add wild garlic to the soup. Cook for a few more minutes. In the end, pour a little milk or sour cream into the soup and blend it with a hand blender. 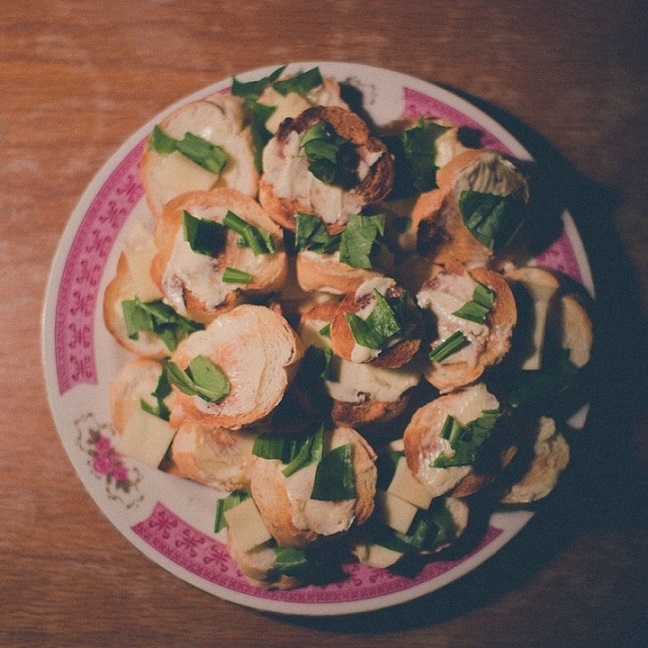 Toasted wild garlic canapés are ready in a couple of minutes and cost almost nothing. You will only need a few rolls, some butter and fresh wild garlic. Toast sliced rolls from both sides on a pan. Toss with chopped wild garlic. 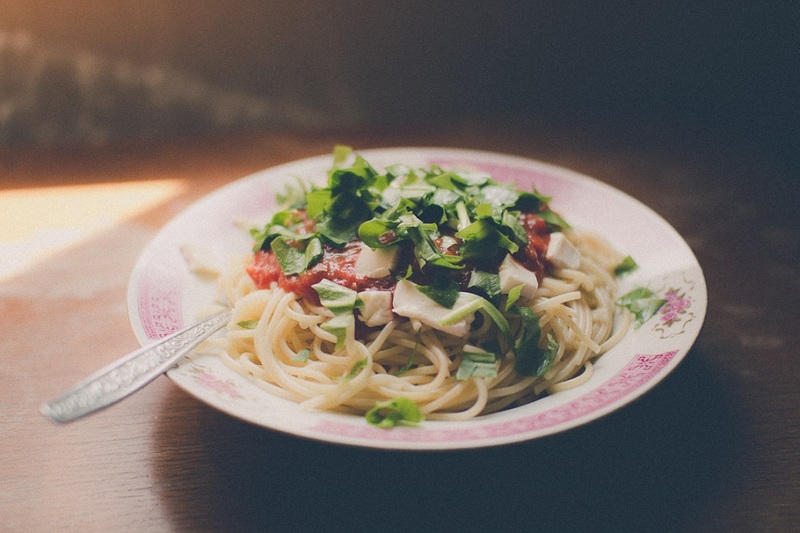 Pasta or spaghetti with fresh wild garlic are a delicious and healthy dish. As is common with pasta dishes, they are easy to prepare, which is why the dish is very popular. Read our simple guide to preparing delicious pasta with this fantastic herb. Boil water, add a little oil (so that the pasta does not stick) and a pinch of salt. Put pasta into boiling water, stir regularly. Meanwhile, sauté minced garlic on a pan. Add tomato sauce, salt to taste and heat while stirring regularly. Add chopped olives into tomato sauce and cook for a while. When pasta is ready, strain it and put it on a plate. Pour tomato sauce over pasta. 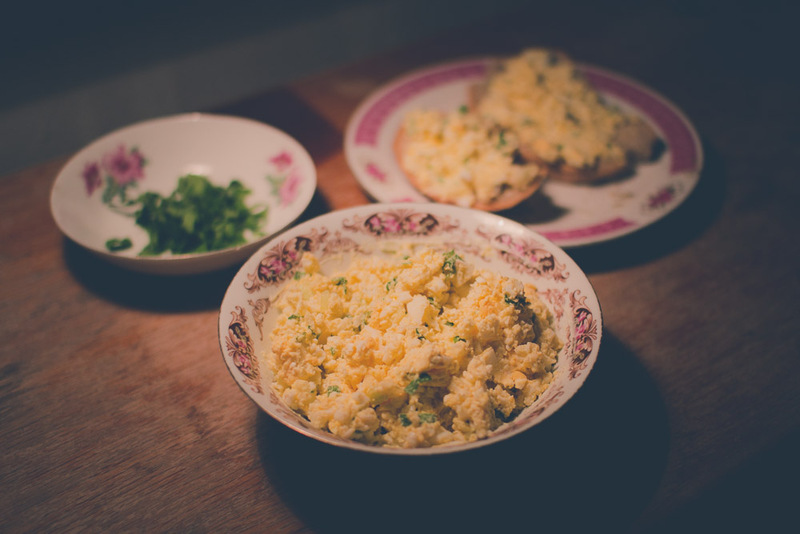 Cover with grated cheese and toss with finely chopped wild garlic. Enjoy! We wish you lots of health! Do you love healthy spreads? 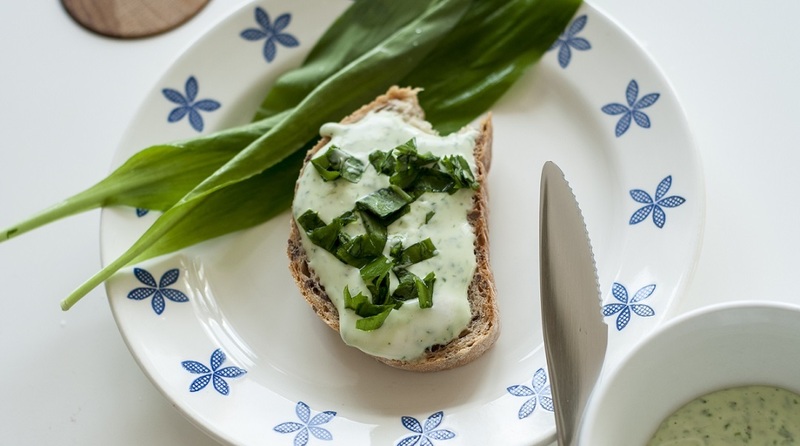 Avail yourself of the gifts of spring and prepare a delicious and healthy wild garlic spread. You can put it on fresh bread, rolls or a baguette. Bon appetit! Mix cheese spread, butter and sour cream at a ratio of 4 to 1 to 1. 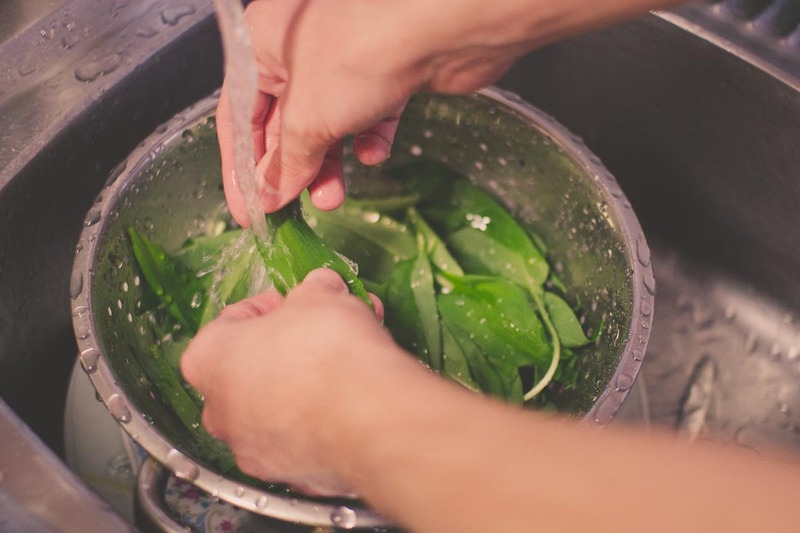 Wash 10 to 15 leaves of wild garlic and cut them into larger pieces. Add ground spices to taste. 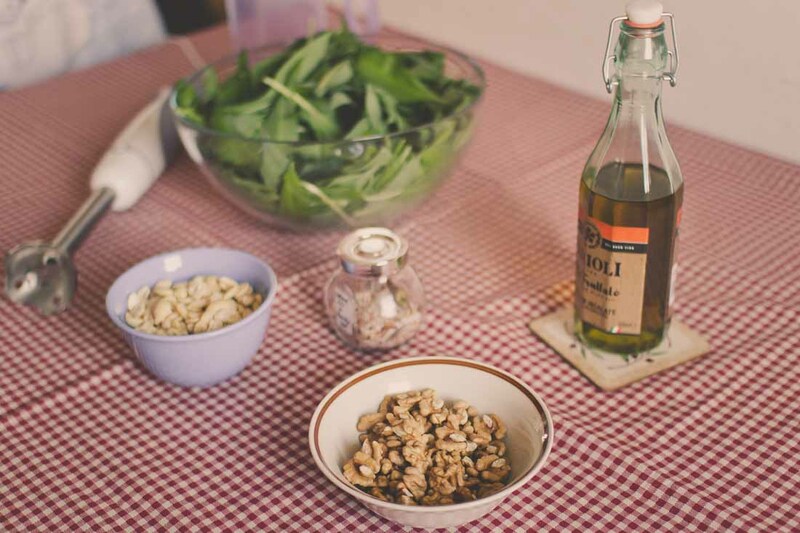 Mix everything thoroughly and toss with chopped wild garlic leaves. Put spread on fresh or toasted bread, roll or baguette. 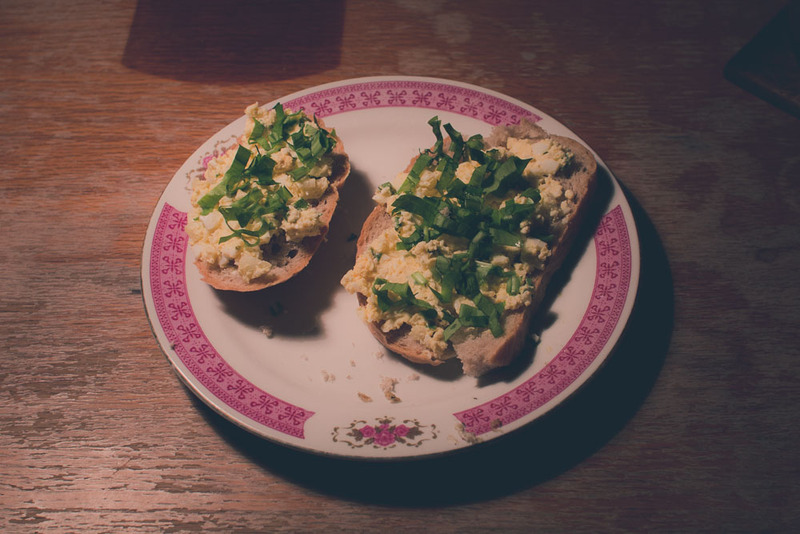 Healthy, simple and quick – our egg spread with wild garlic. It takes almost no time to prepare, but you will remember it for the rest of the year. Read our recipe for this spring miracle.